How much have you spent on coffee at your favorite café this past year? If you figure the average cost of a special drink like a pumpkin spice latte is about $5.00, that is only 40 cups and if you go almost every day, you can break the bank just buying coffee. This is exactly why I decided on getting an espresso machine to use at home. Like me, you probably want one that will make your favorite coffee just like the barista at your café makes it but you may only have $200 to spend. If that’s the case then this article is for you so you can decide on the best pump espresso machine under $200. After I bought the Mr. Coffee Café Barista Espresso and Cappuccino Maker, I decided to see how long it would for it to pay for itself so I put the money I would have spent at the café in a jar every time I made myself my favorite cappuccino. It only took two months! I kept doing that and in a year I had enough to go on vacation to Hawaii. Let me tell you why I decided to buy this particular coffee maker and then choose it as the best pump espresso machine under $200. The biggest thing that influenced me was watching some videos on how easy it was to use and how I could enjoy gourmet cappuccinos from the comfort of my home without unnecessary trips to the café. Besides that I have had Mr. Coffee coffee makers that have lasted me for years and the company has a great reputation of standing behind their products. Another feature about Mr. Coffee’s Café Barista is that it automatically does milk frothing. You don’t have to stand there and hold the steam wand in the milk to make a cappuccino. You just fill it and let the Café Barista determine how much is needed and then return the unused portion to the refrigerator. 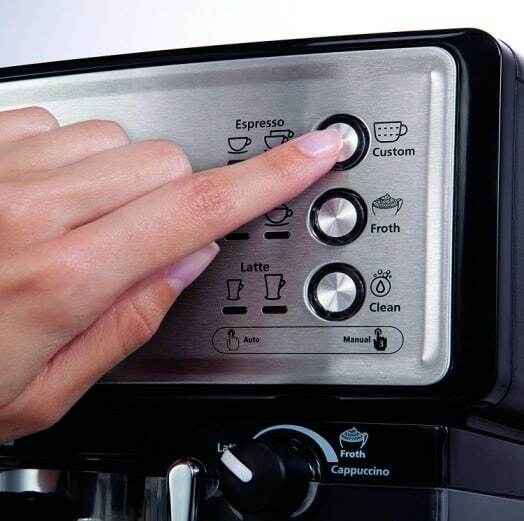 It has a one-touch control panel where you can choose either single or double shot simply by pressing the button one or two times. Everything is programmed in for an espresso, cappuccino or latte. 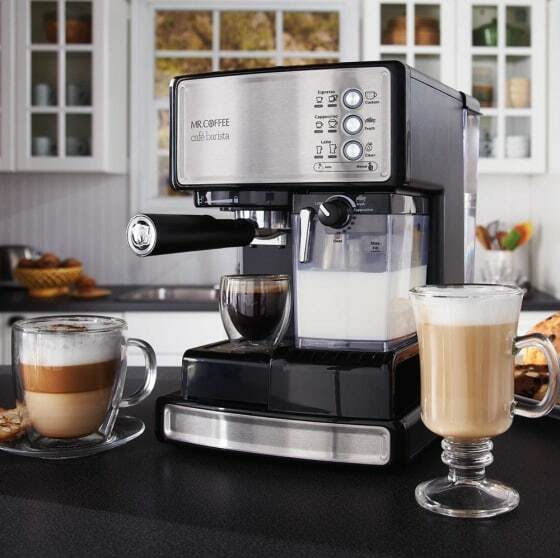 The Café Barista Espresso and Cappuccino Maker gives you 15 bars of pressure for fabulous results. If you’re not sure what that means, a single bar of pressure is one unit of atmosphere pressure. That pressure is used to force the hot water through the coffee grounds and to get the right amount of pressure for an espresso shot, you need at least 8 bars of pressure. The pump also allows two different temperatures—one for brewing and one for steaming, which gives you a continuous supply of steamed water for drinks like cappuccinos. The industry standard is 9 bars of pressure and many believe that having 15 will make the espresso even better. It will give you the perfect amount of pressure to make perfect crema. So the point is that you do not have to have Barista knowledge to create custom coffee drinks just like the café does that you’ve been going to. A recipe book comes with it to make other special drinks like cafe mochas, toffee lattes, espresso martinis, or caramel cappuccinos. It’s nice to know you don’t have to have Barista experience to make custom coffee drinks that you love. If you have ever watched a Barista make your cappuccino you know how long it can take but with this machine that is automated, it can be much faster and taste just as good. 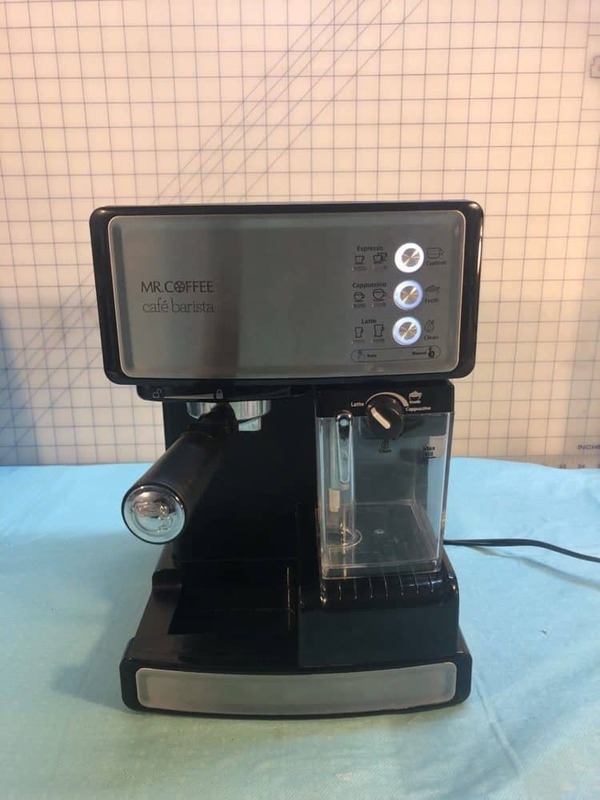 We hope our review of the Mr. Coffee Café Barista Espresso and Cappuccino Maker helps you decide if this is the best pump espresso machine under $200 for you.